Getting a clear, actionable message out to specific target groups is crucial to the success of all financial services marketing efforts. With a regulatory landscape changing so quickly and often, it’s difficult for anyone but market specialists to keep up. That said, even with the most extreme constraints, email marketing, implemented correctly and strategically, offers some of the most effective and unique solutions to known pain points faced by financial marketers every day. 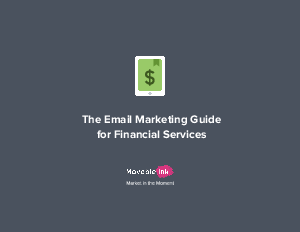 In this eBook, you’ll learn how to use dynamic email content for many types of financial service marketing campaigns — from credit cards to commercial banks to investment houses — to boost engagement and remain safely within the regulatory framework.